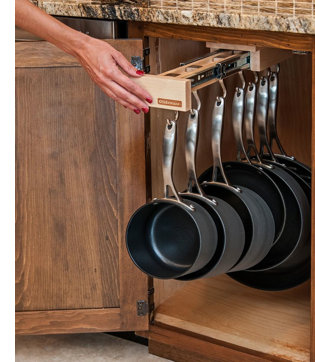 Chances are there’s a cabinet in your kitchen right now where your pots and pans (and who knows what else) are all jumbled in together. 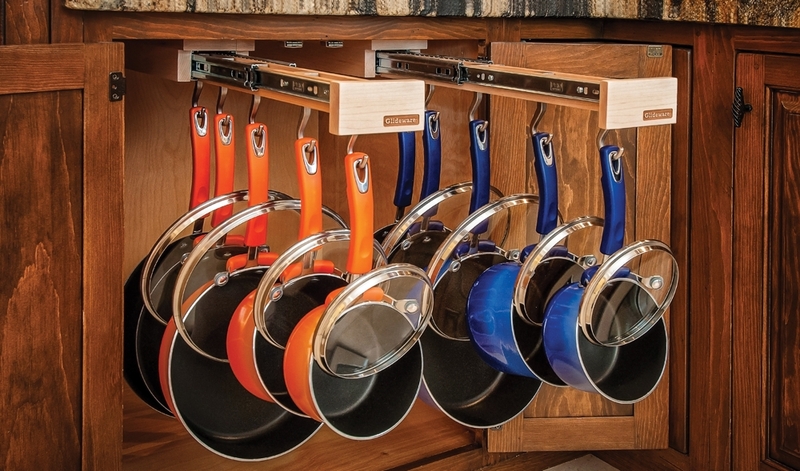 Glideware organizes that mess by vertically hanging your cookware (and other hard-to-store items — mops and brooms, for instance) from a beam that pulls out out from a storage space. 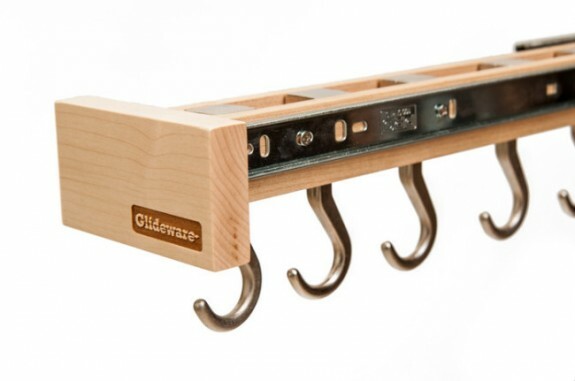 In addition to keeping your pans more organized, Glideware will help prevent them from getting scratched, prolonging their life. We also like how the sliding mechanism (photo, below) allows you to add or subtract hooks as needed. But our favorite part: You can hang a lid together with the matching pot! Do you keep your paper towels out on the counter? They’re taking up valuable space there. And they make your kitchen look more cluttered. Clear things up by mounting a paper towel holder under a counter or cabinet. We love the look of the Faux Paper Towel Holder in the photo below — it’s an easy DIY project if you already have an appropriately sized and located drawer. 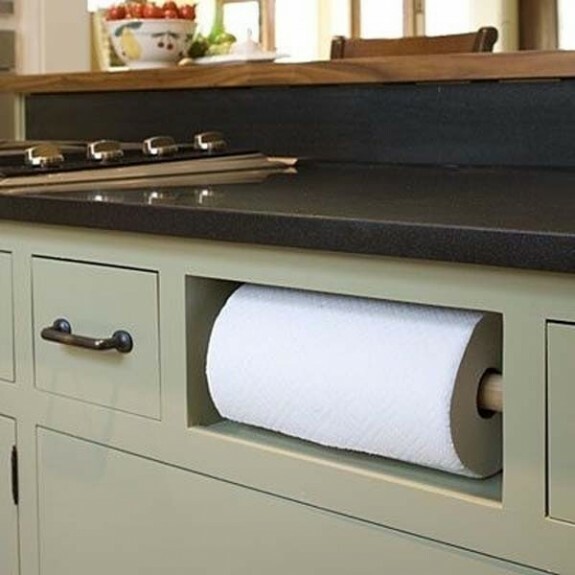 Alternatively, you could install one of several pre-made under-the-cabinet paper towel mounts. As with pots and pans (see above), food storage containers are items that many people have thrown haphazardly into a cabinet. Simply getting that under control can go a long way towards kitchen decluttering. And that’s where Stackerware can help. 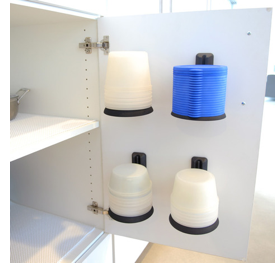 The storage system comes with three different sized containers with identically-sized lids. But here’s the cool part: The container and lids fit onto mountable holder bases. So you can attach them to your cabinet door or underneath a shelf or anywhere else that’s convenient. Very cool. Add a kitchen pantry . . . If you don’t currently have a pantry, it’s hard to 1) store a lot of nonperishable food and 2) keep said food organized. 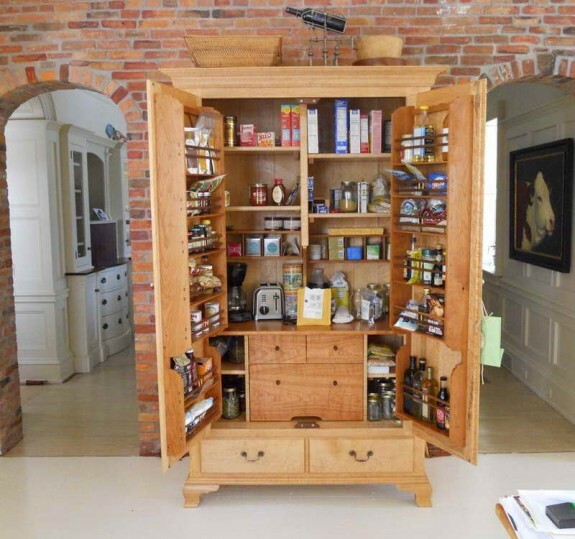 But “installing” a pantry needn’t involve knocking down any walls. It can be as easy as moving a stand-alone cabinet into your kitchen. The one in the photo below is a converted clothes dresser. It holds copious odds and ends yet makes everything look tidy when the doors are closed. But what if you don’t have space for an entire cabinet? Get creative, as illustrated in our next idea. 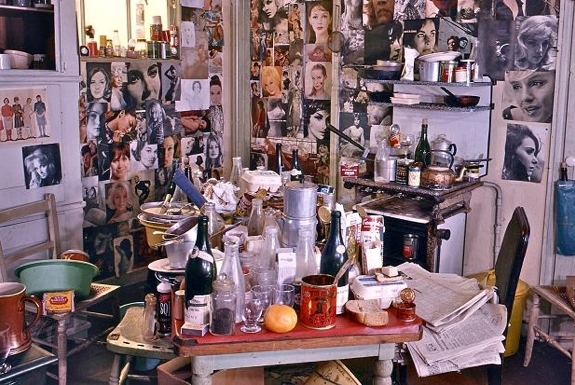 The smaller the kitchen the harder it is to keep clutter at bay. And the more creativity that’s required to optimize the space you have. Two sections of a kitchen that often go unused: the top of the walls (eg. the two or three feet below the ceiling) and the area between the wall and the refrigerator. 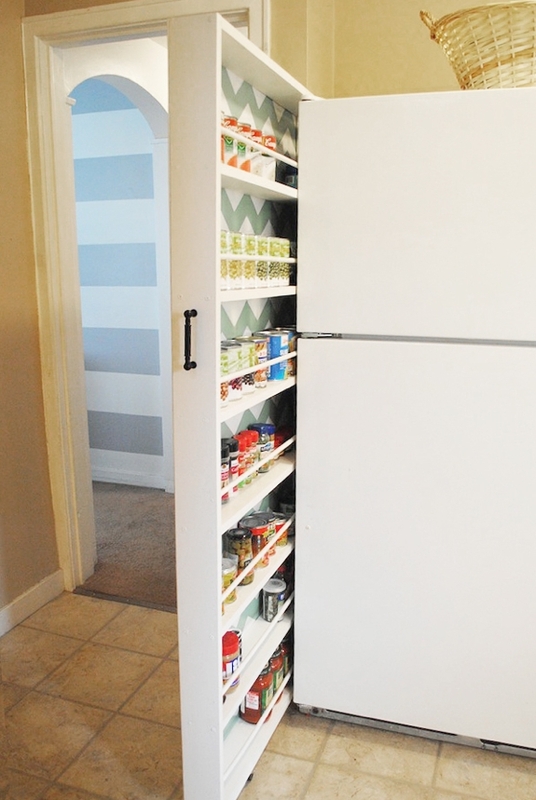 To make use of the latter consider installing a DIY sliding doors canned food organizer like the one shown below. It was built over the course of a single weekend; all the materials to build it only cost US$110. Regular Spot Cool Stuff readers probably remember us discussing the Joseph Joseph Nest in previous posts. 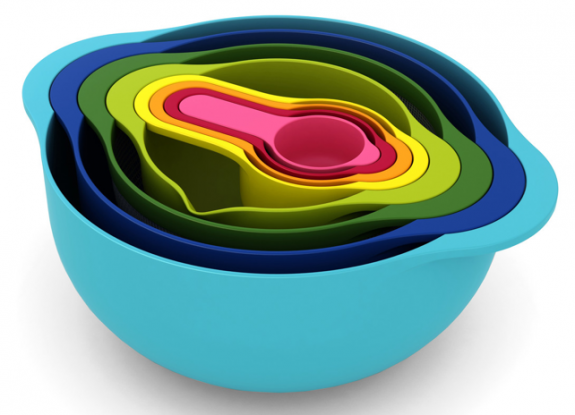 For you newbies: The Nest is a colorful set of mixing bowls, colanders and measuring cups. What’s cool is the way the components are designed to all stack neatly together. So, when they’re not being used, those mixing bowls, colanders and measuring cups stay organized while occupying minimal space. For more, read Spot Cool Stuff’s review of our favorite Joseph Joseph kitchen items. There are several systems on the market that will help you tame that wild jungle of spices that’s taken over your kitchen cabinet (and/or drawer and/or counter top). 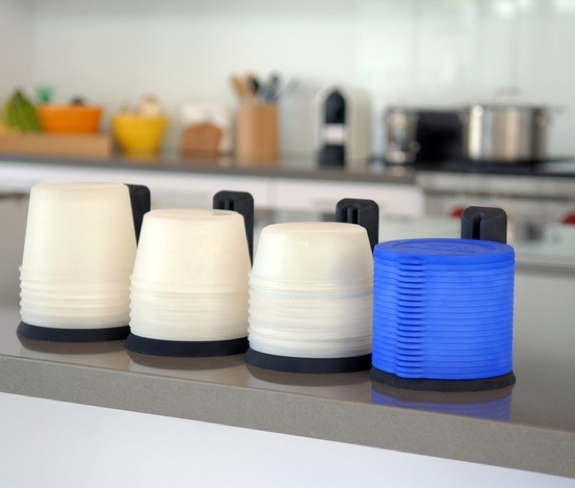 Of them, we’re partial to the YouCopia SpiceStack Bottle Organizer. Sliding drawers hold spices in clearly-labeled sections. We like the modular design of the SpiceStack — they can be combined and come in several sizes. 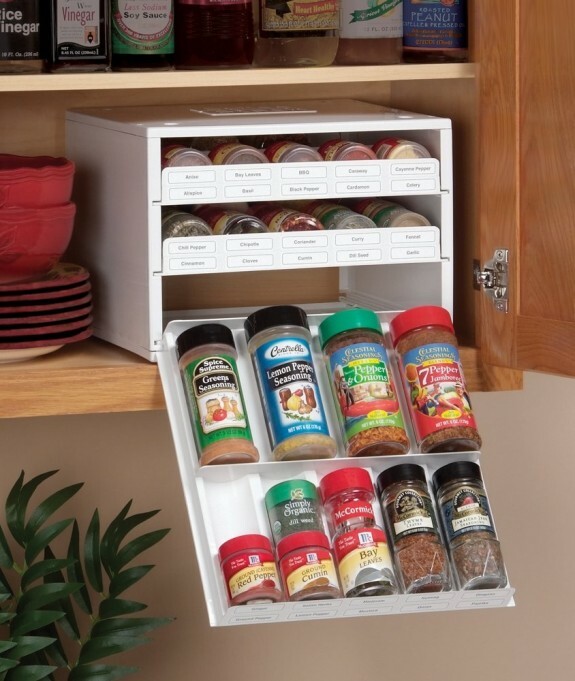 Unlike some other spice organizers, which require you to pour your spices into their specific bottles, the SpiceStack will work with most any round container that spices are sold in.